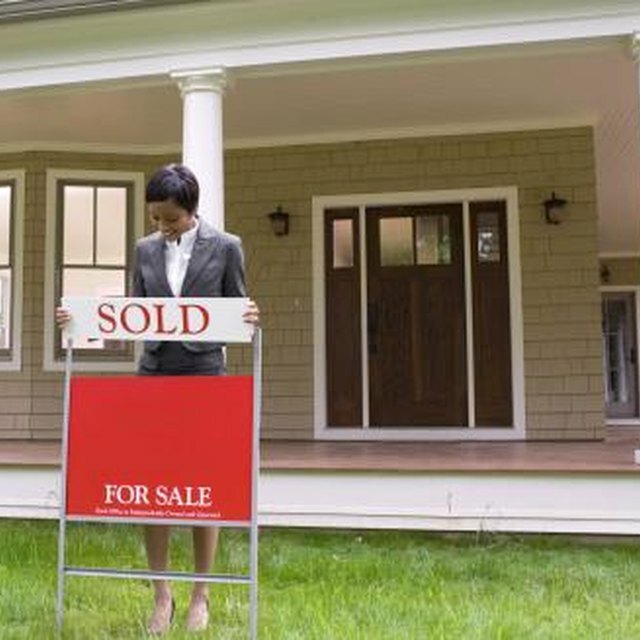 First-time homeowners benefit both the real estate market and themselves when they buy a home. Driving a large share of home purchases, in a healthy housing industry, first-time buyers make up about 40 percent of the market and are eligible for special financial considerations. To qualify as a first-time buyer, you must have held no ownership interest in real estate for at least three years. Lenders verify your first-time buyer status by consulting your credit report and tax returns before allowing you to reap the benefits. As a first-time homeowner, you can build equity in your property and gain tax benefits. You can deduct the mortgage interest you paid throughout the year, reducing your liability at tax time. By keeping the home long enough, you can also watch it appreciate in value, allowing you to sell or refinance in the future to access its equity. Unlike a rental, your own home can be improved to better suit your lifestyle and increase the value. The value of your home may go up over time, and you may also build equity by paying down the mortgage. The difference between your home's value and the loan balance is known as equity. You miss out on equity when you rent or otherwise live in a home you do not own. You can use the equity in your home when you sell as down payment toward a bigger or otherwise better home. When refinancing, you can also borrow against the equity in your home. Most down payment assistance programs offered by government and nonprofit agencies are reserved for first-time home buyers. Because the cost of buying is often the biggest hurdle for buyers, these entities work in conjunction with mortgage lenders to finance a majority of your purchase price. The Federal Housing Administration and certain conventional loan programs target first-time buyers by offering low down payments of 3.5 percent to 5 percent. Low down payment programs and down payment assistance programs may carry income limit restrictions and loan amount caps, and may be available only in certain low-income areas of the country. A Mortgage Credit Certificate, or MCC, allows homebuyers in certain states to claim a tax credit for a portion of the mortgage interest paid over the year. Lenders estimate your credit amount and count it as additional income, helping to improve your debt-to-income ratio, which compares the amount you owe each month to the amount you earn. Mortgage loan interest is deductible on income taxes. As a first-time buyer with a new loan, a majority of your monthly payment is applied to interest rather than the loan principal balance. For the first several years, you can deduct much of your monthly payments, reducing your tax liability.